Every baking occasion demands flour perfectly suited for its intended purpose – a trade secret known by professionals. It’s all about protein! Generally here are the basics. Low protein - Cake & Biscuit, Self Raising Flour, and Biscuit & Pastry Four can absorb less moisture and sugar than standard household plain flour and will produce a softer texture in cakes, perfect biscuits, and flakier pastry. Medium protein – Plain flour, All purpose flour or Pasta & Noodle, Tipo “OO” Flour is perfect for homemade pasta and noodles. Only the pure white centre portion of each wheat grain is used, making this flour naturally the finest and brightest possible. High protein (strong Bakers flour) – Bread flour, High protein flour or Bread & Pizza Flour contains more protein and gluten than standard household plain or all purpose flour and creates dough with greater elasticity. With higher water absorption level, bread flour ensures optimum leavening for your breads and an extra elasticity. During proofing (rising stage) a larger volume and lighter texture can be achieved. Wheat flours carry a type of water-insoluble protein called gluten, which gives kneaded dough its elasticity and allows toughness during bread-leavening process while also preventing the dough from sinking. Meanwhile, in noodle production, gluten has a major impact on noodle properties such as springiness and elasticity. Gluten constitution is what distinguishes one type of flour from the other. Generally, the higher a flour’s protein content, the higher also its gluten levels. Gluten levels are normally determined by the kind of wheat used in producing the flour. Choosing the correct type of flour is extremely important when producing different kinds of foods. The ideal wheat flours for bread and noodles, for example, are those with 12% to 14% protein level. Flours with 10.5% to 11.5% protein are more suitable for cookies, pastry, pie and donuts. Crisp foods like fried snacks, cakes, biscuits and wafer, use flours with protein content between 8% and 9%. The quality of a flour is also dependent upon factors like moisture, ash and other physical parameters such as water absorption. Moisture is the water content contained within the flour. Excessive moisture level (higher than the maximum standard) decreases flour retention and exposes it to faster decay, molding and becoming odorous. Ash is the mineral level contained in wheat flour that affects both processing and the end-result of a product. It can, for instance, induce a color change in bread crumbs, noodles and the likes. Wheat starch or tang meen fun, or Tang flour is all the gluten has been removed. When mixed with water it produces a pastry dough. It is mainly used as a wrapping for dumplings such as ‘har kau’or ‘choy pau.’ It cannot be substituted with potato or other starches. It has different properties and will give food a different texture. It gives a very transparent or translucent texture. 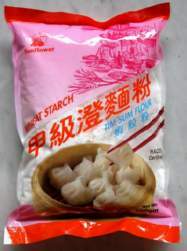 It is essential that the proportion of wheat starch to water be well balanced when making the pastry for har kau. Sago is dried starch granules derived from the pitch of sago tree. Sago flour is very rich in starch and has the same thickening ability as tapioca flour. 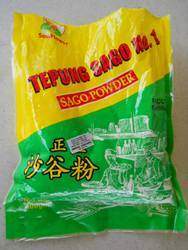 In fact sago and tapioca flour may be used interchangeably for making kuih, bread and cakes. 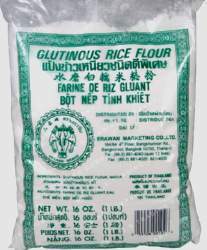 Glutinous rice flour or sticky rice, is a common component in Asian cuisine. It is also known as sweet flour or waxy rice flour. When cooked, glutinous rice becomes moist and firm but also develops a notable stickiness. It is frequently used in Asian recipes to thicken sauces or bind ingredients. This flour is known for its ability to absorb any liquid it comes into contact with, resulting in the creation of a slightly rubbery, clay-like ball of dough. The flour is created by crushing whole grains of rice and processing them until they have reached the consistency of a fine powder that is ultra white in color and slightly sweet. This naturally sweet flour is then used to make buns, dumplings and assorted pastries. Just another name for Hong Kong flour made in Singapore and Malaysia. Superlite is a super soft flour. The Flour have been beached to give a very white texture. It is best used for making Hong Kong type steamed buns (bao), Japanese castella cake, Malay sponge cake (kueh bahulu) and others where a specially soft and light texture is required. 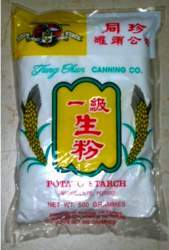 This flour is also referred to as "Hong Kong Flour" by some users. 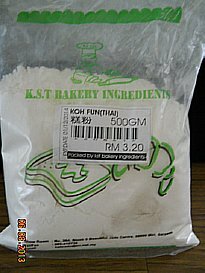 Koh Fun is commercialised cooked glutinous rice flour. It is mainly used in snow skin Mooncakes and as fillings like lao poh piah and many others. Here are two methods to make your own. 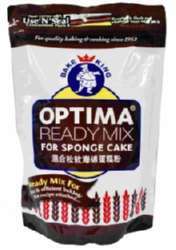 Optima flour is a premixed cake mix flour made in Singapore for making sponge cake. It contains sugar and baking powder and other conditioner to give nice texture of cake. To substitute Optima flour, just substitute any sponge cake mix of any brand available. 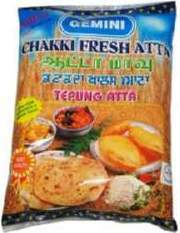 Atta flour is a whole wheat-flour made from hard wheat grown across the Indian subcontinent. It may be used to make bread with, but add 200 g of finely ground Oats to 1 Kg of Atta Flour. Flatbread made from Atta, such as chapati, roti, naan and puri, are an integral part of Indian cuisine. Atta is the main ingredient of most varieties of Indian, Bangladeshi and Pakistani bread. 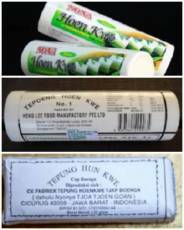 Hoen Kwe flour is green bean/pea flour that has been flavoured and are made in Indonesia, Singapore and Malaysia. 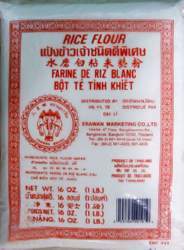 Hoen kwe flour commonly comes in white packaging which is uncoloured. There are some green packaging which has green coloured , while the red packaging has pink coloured and yellow packaging has yellow coloured. 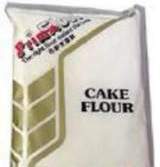 Cake flour is a finely milled flour made from soft wheat. It has very low gluten content, making it suitable for soft-textured cakes and cookies. The higher gluten content of other flours would make the cakes tough. Related to cake flour are masa harina (from maize), maida flour (from wheat or tapioca), and pure starches. Cake Flour is a superb quality, soft-as-silk flour. It has excellent tolerance to a high amount of butter and sugar, resulting in cakes of good volume. This flour is best used for baking sponge cakes and very rich cakes like pound cakes. Cake flour does not have Sugar or baking powder added . To Substitute cake flour - For every one level cup of all-purpose flour, remove two tablespoons, and then add two tablespoons of corn starch back in. Gluten flour is a natural high protein, free-flowing powder extracted from premium quality wheat flour. It contains over 70% protein. It can be added to low gluten flour to enchance the bread volume. It increases the baked bread elasticity without toughening the eating quality. Gluten flour or powder may be obtained or bought from "Heath Food Shop". You can buy "loose" depending on how many gm you want instead of in packet. Wheat flours contain a protein called gluten which, in the presence of water, forms an elastic network throughout the dough. This is the stuff that gives bread dough their rubbery consistency. The whole point of kneading bread dough, in fact, is to organize the strands of gluten running through the dough into a strong, resilient, interconnected web. It is this web of protein that will entrap the bubbles of CO2 given off by the yeast as it ferments, enabling the dough to rise. Without the gluten, the CO2 would just bubble up to the surface and be lost. But flour vary greatly in both the quantity and quality of the gluten they contain because different strains of wheat from different regions and different growing seasons have different gluten profiles. There are times when gluten is not your friend; in a cake batter, excess gluten will create a chewy, coarse-grained cake, and in pastry dough it will produce a tough pie crust. But for bread you want lots of strong gluten to produce a well-risen and well-shaped loaf. This is why there are special flours for special purposes: cake flour, pastry flour, bread flour, etc. All-purpose flour is typically a blend of "hard" and "soft" wheat which will perform pretty well in most roles. It usually contains 10-12% gluten. It can be used for bread, but will tend to produce a denser, flatter loaf. Some people will add 1T extra per cup of flour when using all-purpose for bread. Bread flours have from 12-14 percent protein. They will feel decidedly more elastic while kneading, and will give full, rounded loaves. These flours are made from hard winter wheat from northern states. Besides the quantity, the quality of the gluten will vary. Some glutens are better at forming the elastic network than others. You can judge this for yourself by making a "gluten ball" from different flours: make a stiff dough using just water and 1/4 c of flour. Knead it until it becomes quite elastic, then continue kneading it between your fingers under a stream of water. This will wash out the starch from the flour and after a few minutes of this you will have a ball of pure gluten. By playing with this ball, stretching and folding it, you will see that some are far more resistant to tearing than others. A good bread flour will enable you to pull the gluten into a thin membrane. Bread Flour or high-protein flour is ideal for making all varieties of bread, buns, Chinese crullers- "You Cha Kway"or other yeast based products which require a higher level of gluten. If you substitute Plain flour with bread flour bread, your bread won't rise as high or be as strong because of the lower level of gluten holding the air pockets together. or bread flour although they may still be sold as plain flour on the shelves. on how much or gm you want instead of in packet or from Asian grocery shops. Why does bread dough need high protein flour? Every baking occasion demands flour perfectly suited for its intended purpose. That is why HIGH PROTEIN flour is good for making Bread, and a MID PROTEIN flour for making Noodles. The key point is when making bread is to choose a high protein flour and NOT plain flour or all purpose flour. Great bread dough comes from using flour with a protein level of 12-14%. The high gluten level in the flour gives the dough a good elasticity and robustness. Gluten is the key to great bread dough; it forms strands which bind together like a web during the mixing and kneading process, air bubbles are trapped in this web and expand during cooking allowing the dough to rise. During baking the stretched gluten becomes rigid as the moisture evaporates from the heat of the oven and sets the dough structure. The lower the protein level, the lower the gluten level, therefore the dough will be less likely to hold its shape or rise as well. 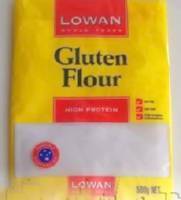 Gluten free flours - As explained above gluten is what makes wheat-based bread dough so sticky and elastic. This helps the dough hold in the air bubbles created by the yeast so that it will rise and eventually bake into a fluffy, porous loaf. If you're gluten-intolerant, though, you'll need to use gluten-free flour, along with an arsenal of ingredients to make it behave like it has gluten. Just another name of flour made in Singapore and Malaysia. Top Flour is an extra-fine quality flour to give exceptionally smooth and fine texture for your baking needs. It is especially ideal for baking very fine cakes; such as chiffon cakes, swiss rolls, crepes, cake doughnuts and butter cookies. All-purpose or plain flour is a blended wheat flour with an intermediate gluten level, which is marketed as an acceptable compromise for most household baking needs. Plain Flour is an all-purpose flour, best used for making cakes, pancakes, pastries, batter and as a thickener. This flour is also ideal for Oriental specialities like Chinese dumpling (bao), Chinese dough fritters (yu tiao) and roti prata. 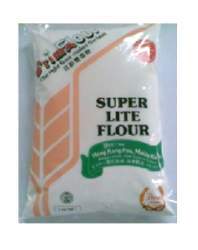 Bleached flour ( Hong Kong Flour or Water Lily flour) is treated with flour bleaching agents to whiten it (freshly milled flour is yellowish) and to give it more gluten-producing potential. Oxidizing agents are usually employed, most commonly organic peroxides like acetone peroxide or benzoyl peroxide, nitrogen dioxide, or chlorine. A similar effect can be achieved by letting the flour slowly oxidize with oxygen in the air ("natural aging") for approximately 10 days; however, this process is more expensive due to the time required. Self-Raising Flour is a premium quality flour blended with the right amount of leavening agents. It is best suited for baking cakes, hot cakes such as American pancakes and cookies. It is also excellent as a batter for frying chicken, fish, prawns and banana fritters. Wholemeal Flour is a high-protein high-fibre flour specially milled for the health-conscious. Just mix equal quantities of Prima's Wholemeal and Bread Flour to make delicious and nutritious wholemeal bread, buns and cookies. Semolina is a granulated wheat flour. It is best for making sugee cake, semolina pudding, cookies and soup as well as baby weaning food.